Blood vessel and blood circulation disorders are the most frequent diseases in the developed countries and they also contribute most signifi cantly to the permanent negative impact on the quality of life of productive age people. Varikosan® series has been developed on the basis of both the modern and traditional knowledge of the vessel wall construction. Varikosan® products contain a balanced combination of natural substances for care for legs. 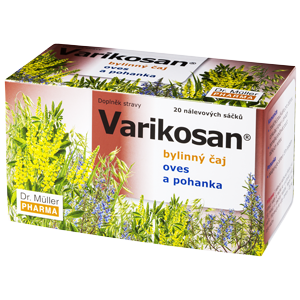 Varikosan® series food supplements contribute to maintenance of natural venous system condition. The product contains extracts of horse chestnut seed, wine grape seed and butcher's broom, and vitamin C.
Tablet composition: Bulking agent (sorbitol), horse chestnut seed extract, wine grape seed extract, ascorbic acid, stabilizing agent (maize starch), butcher's broom extract, glidant (colloidal silicon dioxide, magnesium stearate). Composition of the coat: Hydroxypropylmethyl cellulose, polydextrose, talc, maize starch, polyethylen glycol, calcium carbonate, colours (iron oxides). 1 to 2 tablets daily. Swallow and follow with sufficient amount of a liquid. Do not exceed the recommended doses. The product does not substitute varied diet. Not suitable for pregnant women and breast-feeding women. The product should not be used in children below 12 years of age. Not suitable in case of gastric and duodenum ulcers, renal and heart insufficiency, thromboembolic disease, and in case of use of drugs that influence blood clotting (such as warfarin). Do not use for the long-term without consulting a physician. Keep out of the sight and reach of children. 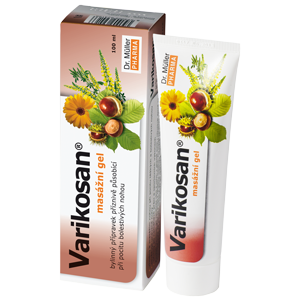 Use: Apply Varikosan® Massage gel in the morning and in the evening and/or several times daily if needed. You can use it both for packs and massages. For massages apply sufficient amount on the legs and massage gently for at least 10 minutes in the direction from the feet to the heart. If the gel is abosrbed, apply it repeatedly. 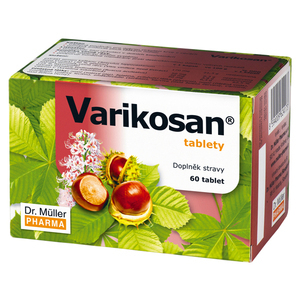 Use: Varikosan® Spray is a product for easy contactless application on tired and swollenlegs. Spray the product on the legs several times a day. If the spray is absorbed, you can repeat the application. Herbal tea contains oats and buckwheat. 1 – 3 cups daily. Do not exceed the recommended doses. The product does not substitute varied diet. It is suitable for pregnant and breast-feeding women. The product may cause photosensitization in sensitive people. Not suitable for children up to the age of 3. Keep out of the sight and reach of children.